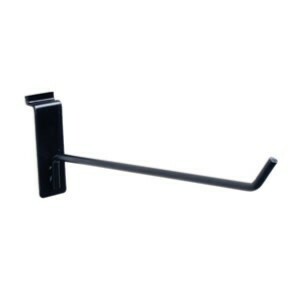 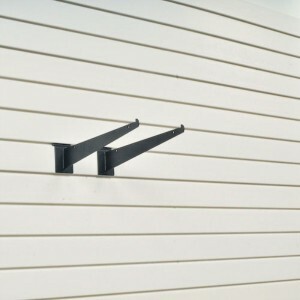 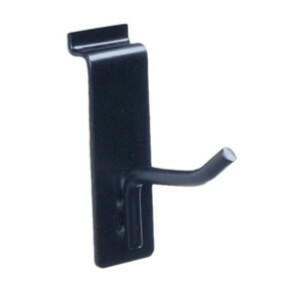 The 1″ single hook is good for hanging single small items such as trowels, garden forks, paint scrapers, paint brushed, gloves, hats, clothing, etc. 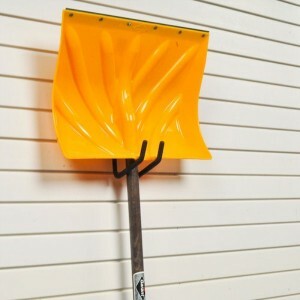 The 12 in. 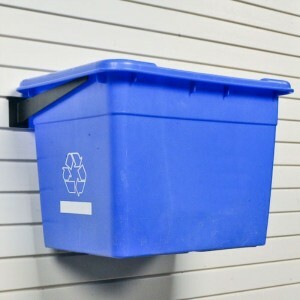 shelf bracket will hook right under the sides of your blue and black recycle bins to raise them off the floor. 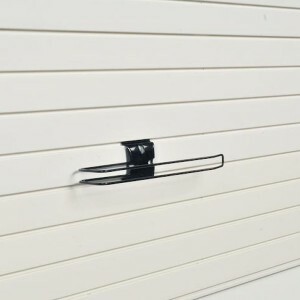 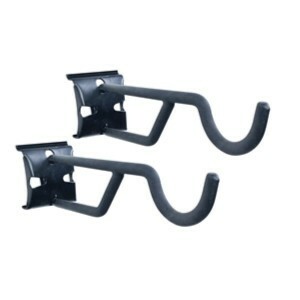 The 26″ industrial hook (2 pc set) is an innovative solution for storing tires, lumber, a canoe or kayak, and other long and heavy items….raising them off the floor and onto the wall. 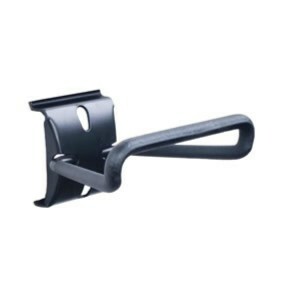 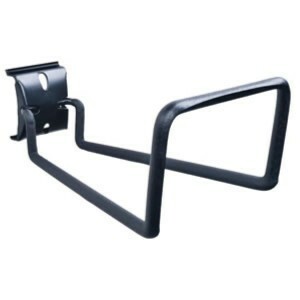 The 4″ loop hook is perfect for hanging small ladders, extension cords, hoses, etc. 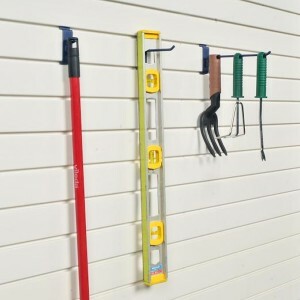 Organize your tools and equipment to keep them easily accessible. 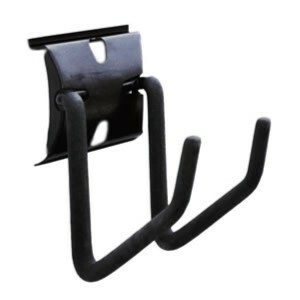 The J hook is ideal for storing lawn chairs, gardening tools, sports gear, extension cords, wheelbarrows, green bins, hoses, sledgehammers, etc. 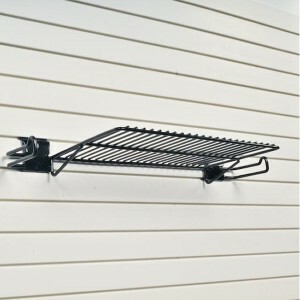 The 8″ single hook is great for storing paint brushes, clothing, dust mops, levels, light tools, etc. 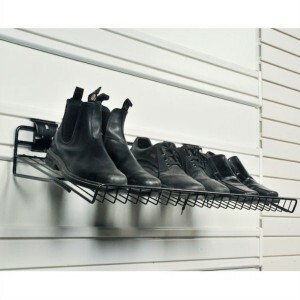 The angled shoe shelf works well for storing shoes and boots neatly and off the floor. 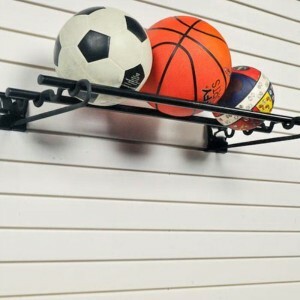 The ball rack is great for storing all types and sizes of balls, for hanging sports shoes and sports clothing. 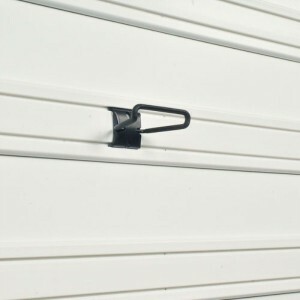 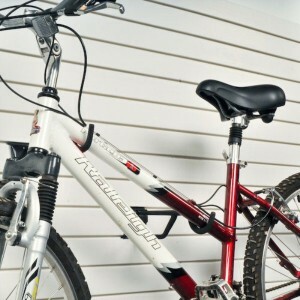 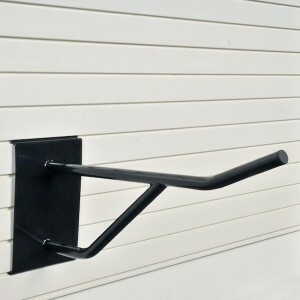 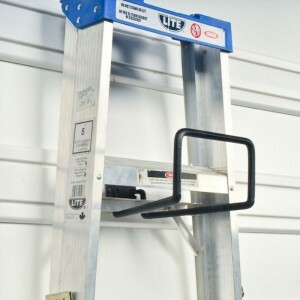 The deep utility hook is great for storing ladders, large extension cords, hoses, etc. 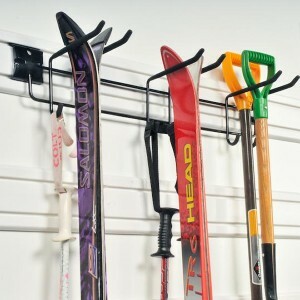 Keep your equipment organized and easily accessible. 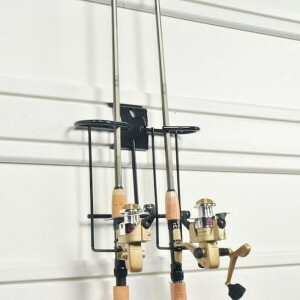 The fishing rod holder neatly stores 2 fishing rods vertically. 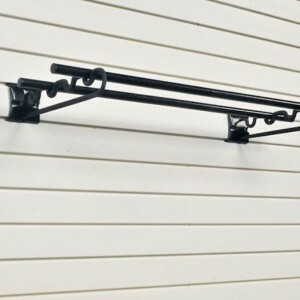 Quickly and easily find your fishing rods whenever you need them. 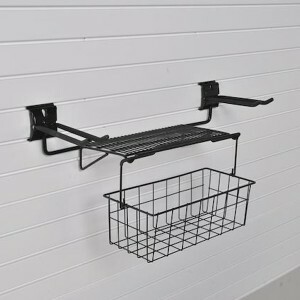 The garden tool rack with basket is a unique storage solution for the avid gardener. 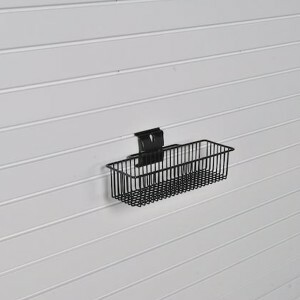 The portable basket hangs on the rack and can be filled with your planting or potting supplies, making it very convenient to take with you out to the garden. 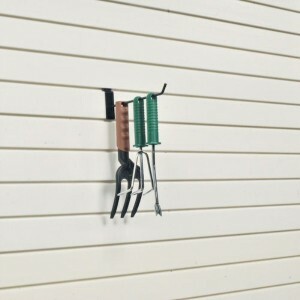 Keeps your gardening tools and supplies within view and easily accessible. 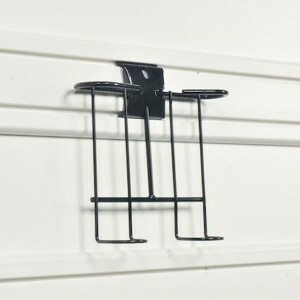 The golf accessory holder houses 2 golf bags (one on each side), and sports a shelf for shoes and golf accessories. 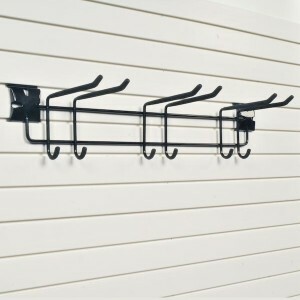 Keep your clubs, tees, balls, and shoes easily accessible so you’re always ready to play. 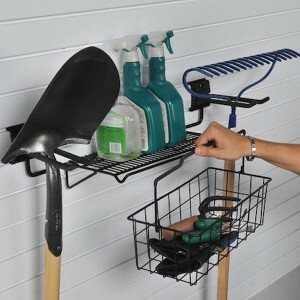 The long tool triple hook is the perfect solution for storing all your shovels, rakes, brooms, mops, skis, ski poles, etc. 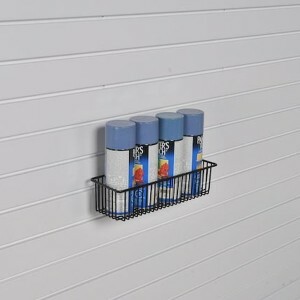 The mini basket is perfect for storing aerosol paint cans, cleaning supplies, automotive supplies, craft supplies, etc. 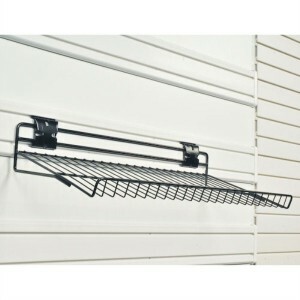 Keeps smaller supplies organized to make them easily accessible. 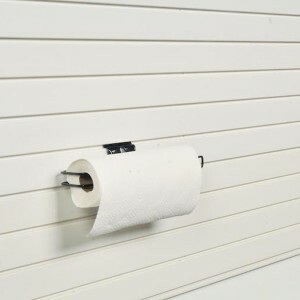 The paper towel holder conveniently hangs your roll of paper towel within easy reach for those quick clean-ups.